In the late 1920’s and early 1930’s, following the First Great War - WW I, life in certain parts of Europe was challenging. Fascism, especially in Italy where the rise of Benito Amilcare Andrea Mussolini to the position of the youngest prime minister in Italian history, was a reality. Fascist squads and militias, inspired by Mussolini, swept through the countryside terrorizing the local population. Difficulties and public oppression abounded. Opportunities for individuals and families who did not support Mussolini’s style of government were being severely challenged. So in 1930 Emileo Ceccon and his young family left their ancestral home in the north-eastern Italian town of Paese, boarded a boat and headed for Canada. Their ocean transport landed them in Montreal alone and with little money and even less direction. They did have a sponsor, a necessity for immigrating to this ‘new’ land of opportunity. Upon arrival the Ceccon family then got on a train and headed for British Columbia. Several days later and thousands of kilometres from Paese they arrived in Coalmont. A booming coal mining town on the banks of the Tulameen River, eighteen kilometres northwest of the town of Princeton… a town that remains the anchor for the Ceccon family to this day. Work opportunities in the coal mine and on the Canadian Pacific Railway, Kettle Valley line, was easy to get at this time and the young family settled down to their new life in Canada. Papa Ceccon taught himself and his family English and was hired on as a section-man by the CPR. Shortly after beginning work Emileo and family were moved to the small rail community of Kirton, east of Osprey Lake and just to the west of Summerland, BC. In the years that followed there were several moves for the family to other communities along the Kettle Valley railway. Then in 1944 the railway re-located the Ceccon family to the copper mining town of Allenby, headquarters for the giant Copper Mountain mine. The handsome young Rollo Ceccon had just reached his sixteenth birthday. This new life in Canada was not always easy for the Ceccon family. Harsh winters, hot summers, small two or three room houses, without running water, indoor plumbing or electricity, but as Papa Ceccon always reminded his family…”Il Canada è un paese meraviglioso… il meglio." “Canada is a wonderful country… the very best”. However, just like the oppression of the African Americans in the United States, immigrants to Canada were often discriminated against and impacted by racial slurs and hazing. The Ceccon boys were no exception to this type of community behaviour when they attended school in Penticton. Although there was plenty of opportunity… adversity was commonplace as well. 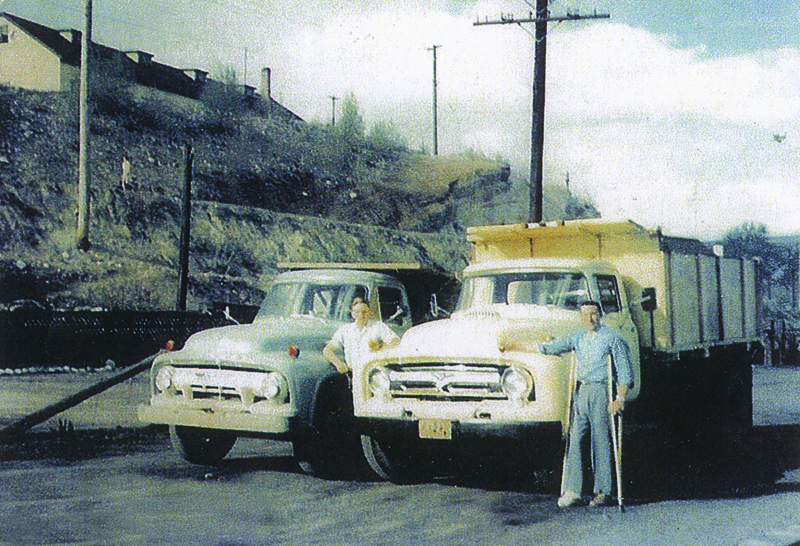 After studying auto and diesel mechanics in Edmonton and spending some time working casual jobs in the mining operations of Copper Mountain, Rollo Ceccon was able to purchase his first car… a 1950 Ford. 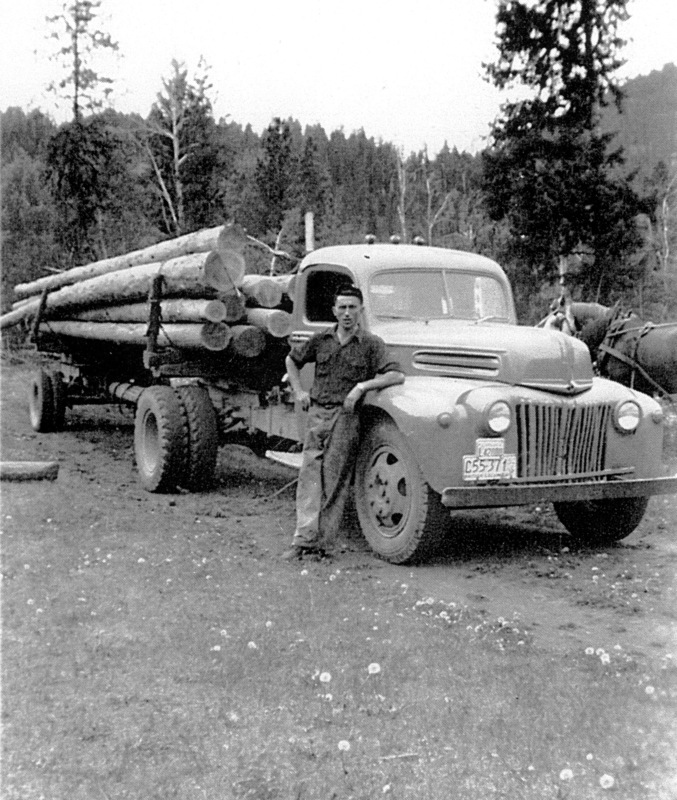 Shortly thereafter he and a friend, Ray Johnson, were approached with an offer to truck lumber from British Columbia to Alberta… the rate $1,000 per trip… more money than was averaged in several months at most jobs of the time. So it was off to the dealership and an even trade, the Ford car for a used 1944 Ford truck and Ceccon Trucking had started. But like most things that are too good to be true, Ray Johnson left and the Alberta lumber trucking business went sideways. An interesting side bar to this story is Rollo Ceccon’s brand loyalty. His first car was a Ford, his first truck was a Ford, many of the trucks in his business over the years were Fords and today he is driving a brand new Ford sedan. “I have not always been dealer loyal but I have been brand loyal, “ stated Rollo. Next came the offer to purchase a 1939 Mercury convertible… and what dashing young man wouldn’t want to be the first in town to own a convertible. So Rollo made the deal, and then realized that the fancy convertible would just cost him money and not make him any. So he traded the convertible for a three ton Ford truck… much to the dismay of many of the young ladies in the area… no doubt. But a three ton truck with no box was not of much use. 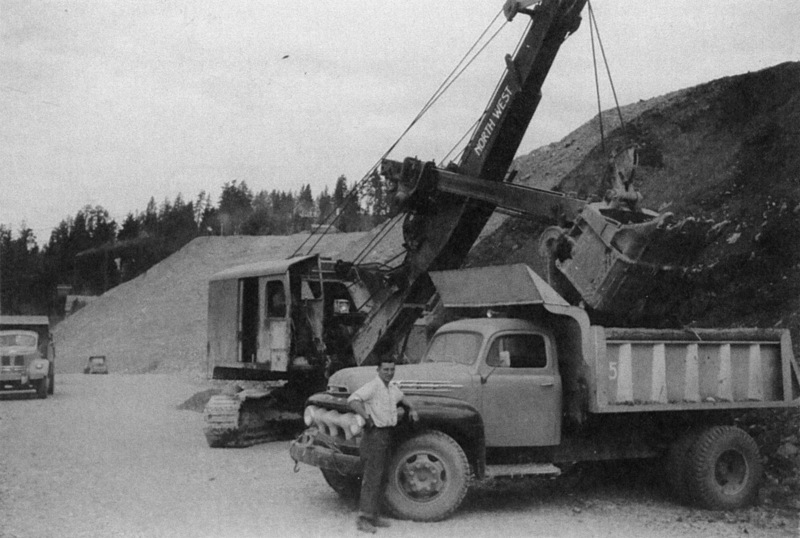 So when a solid job offer came from the management of the Copper Mountain mine, Rollo drove the truck to Vancouver and had a dump box and hydraulic hoist installed. Although everything seemed to be going just right for Rollo Ceccon and his newly formed company, adversity was just around the corner. 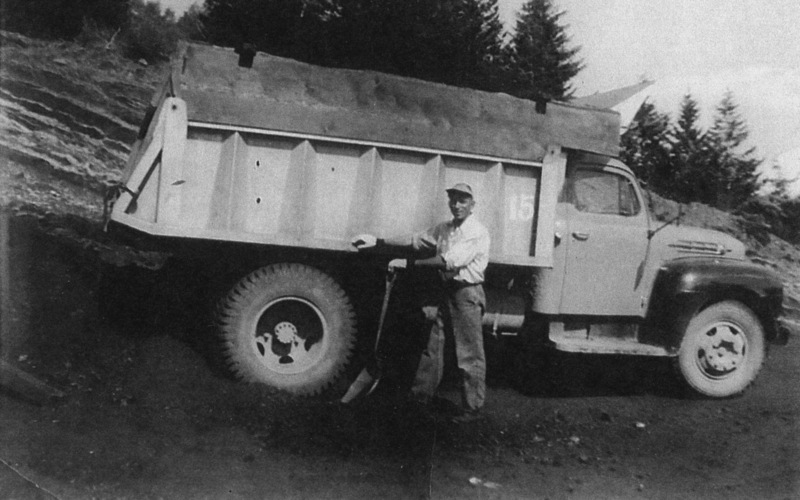 Early on the morning of November 10, 1954 while working at the Copper Mountain open pit mine and trucking mine waste to the ‘glory hole’ (a surface depression as a result of mining operations) Rollo experienced what many believed should have been a life ending accident. He was backing the loaded truck up to the hole when the bank gave way and the truck crashed and smashed down over two-hundred feet of rock and debris. Now remember, this is before seat belts and roll protected truck cabs… the truck, with Rollo in it, was flattened. A fellow trucker happened upon the accident scene and reported it to the mining crews, but there were no ‘jaws-of-life’ or high angle extraction teams… it took hours to get Rollo out of the truck and back up to the surface and then to hospital in Vancouver, over 285 kilometres away. The result, hundreds of stitches, crushed vertebrae, broken bones, unconscious for ten days in Vancouver’s General Hospital… but the worst was… just over two years in a full body cast. Not able to move his upper body, how could Rollo and the fledgling Ceccon Trucking Company survive? Adversity may have taken it’s best shot! But Pappa Ceccon understood what was necessary and encouraged his oldest son to keep going and that is just what Rollo did… denying adversity its goal. 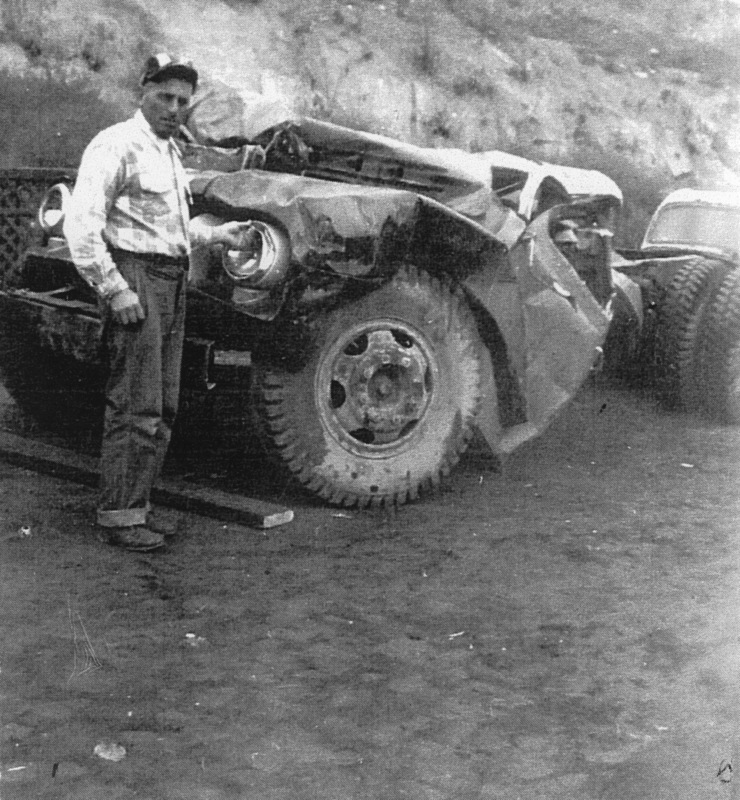 When the cast came off around Christmas 1956 and he had regained some of his strength he took the insurance money from the accident and made a down payment on another truck. Ceccon Trucking was back in business with Copper Mountain Mining. Just when it seemed that the worst may have passed happiness showed up. On March 1st of 1957 Rollo Ceccon married Blanche, an attractive young lady he had met at the local Traveler’s Cafe. Then on March 2nd… the mine shut down. Ceccon Trucking was on the ropes again. But that raw gut determination to succeed that took the family out of Italy years earlier still prevailed. 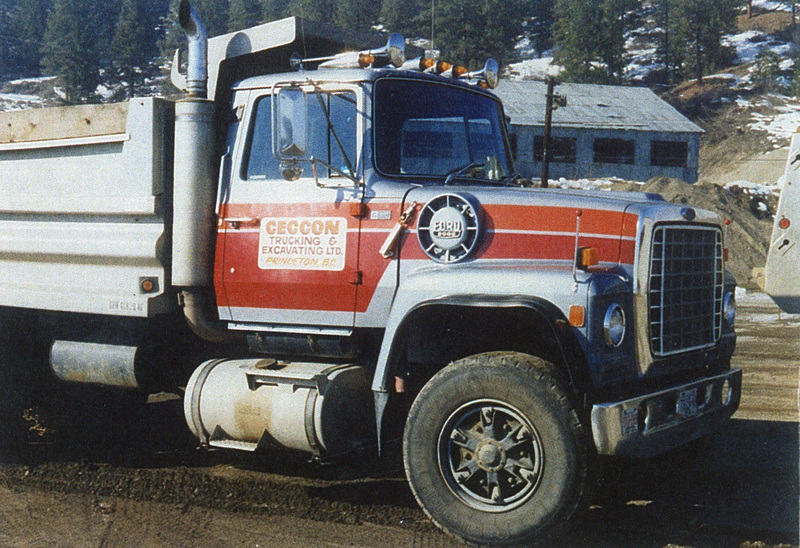 With the shutting down of Copper Mountain, materials had to be moved to other mine sites, and Ceccon Trucking did the work. The Bethlehem Copper mine (now Highland Valley Copper) east of Ashcroft, British Columbia was growing and the Ceccon boys worked there as well. The company also purchased a small backhoe and worked around Princeton and area on sewer systems, septic tanks, basements… anything that had to be dug out or moved by truck… the Ceccon boys were all over it. 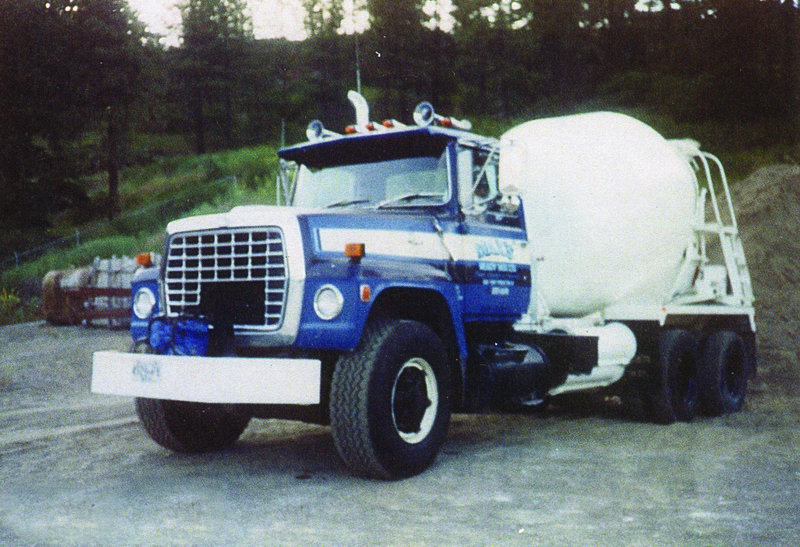 In the ensuing years, Ceccon Trucking added a gravel pit and crushing equipment to their fleet and the company could be found working on mine sites around southern BC, including Brenda Mine west of Peachland and Sparwood, at the BC/Alberta border. They crushed and hauled the gravel for the runway extension at Kelowna’s airport and worked in Harrison Hot Springs. As well, they continued their work on logging roads and highway construction projects. 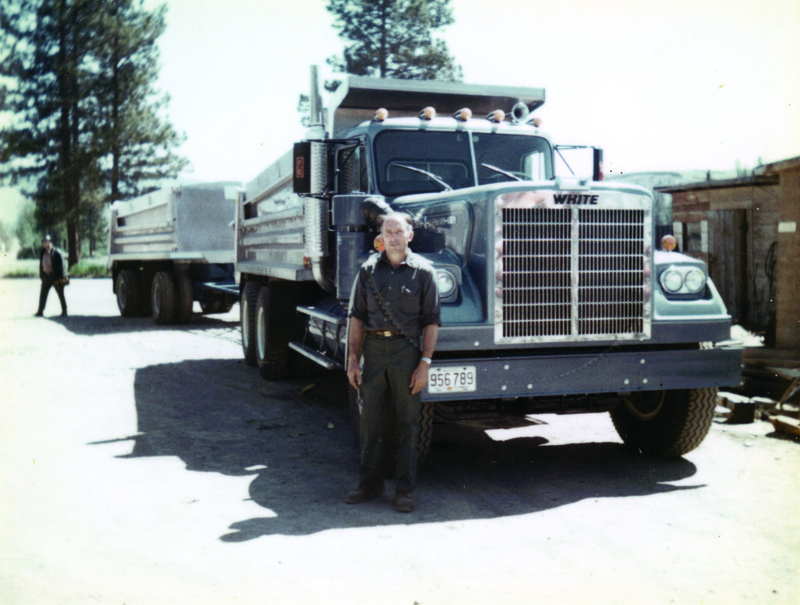 It certainly was not all smooth roads for Rollo and his family and Ceccon Trucking. But that same raw determination that got both the family and the business around life’s potholes of adversity endured. Success followed. 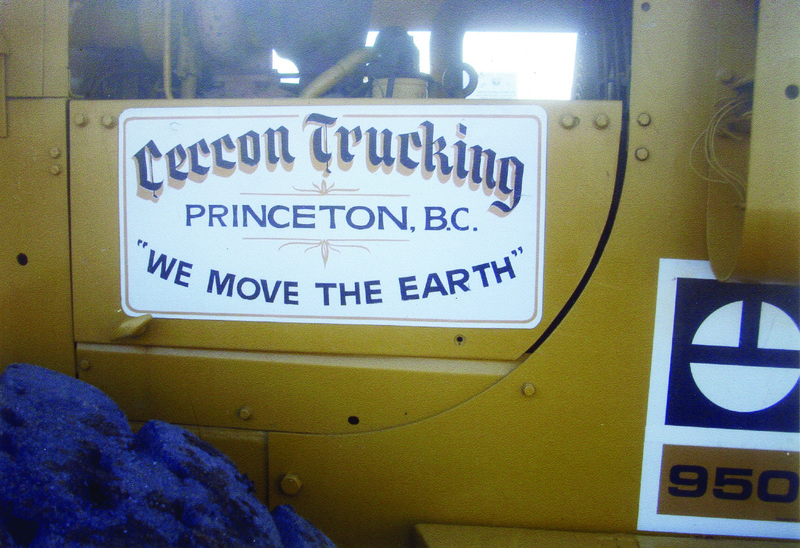 Could Rollo Ceccon be called the Trucking Prince of Princeton? After all he has been named Citizen of the Year and honoured by the local Lions Club… We’re not sure, but there does not appear to be any other contenders for that title. All the ignition keys have been turned off, the equipment sold and Ceccon Trucking shut down. Rollo is retired and still enjoys life with his wife Blanche, their two children and grandchildren… where? In Princeton, BC of course, where he seems to know everyone and everyone knows Rollo.